Sick and tired of getting to the bus stop, only to find you can't read the timetable or, worst still, it's out of date? Transport for London (TfL) is aiming to change all that with a series of new e-timetables that provide up-to-the-minute travel updates for public transport. 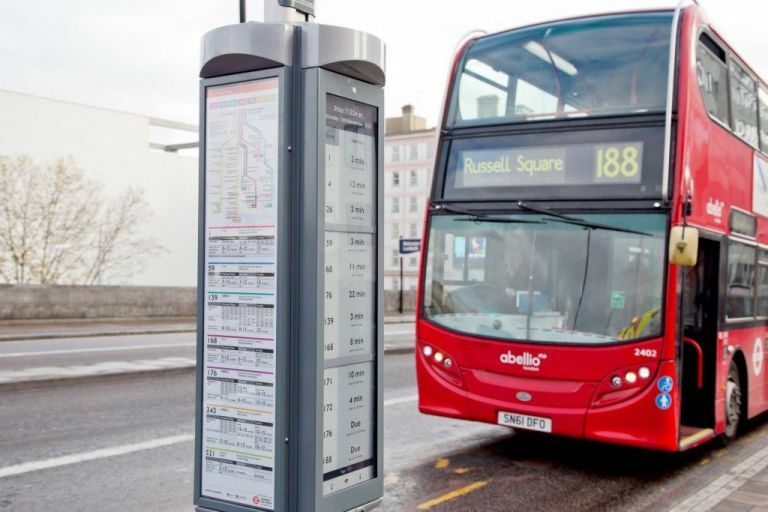 The e-paper displays, which are currently being trialled at a single London bus stop, will provide countdowns for coming buses, route maps for each one and all the usual timetable info you'd expect. These solar-powered screens are roughly the same size as a standard bus timetable panel (roughly three A4 pieces of paper stacked end-to-end) and wil come with a set of colourful buttons to help switch between each utlity, even in poor light. TfL aims to make the new system as economical as possible. Alongside those aforementioned solar panels, the displays will work similar to Kindle (meaning it won't need a huge amount of power to work) and will use 3G to source traffic info and updates. The first bus stop to employ the system, near Waterloo Bridge, is already up and running, with TfL looking to add a further three at Piccadilly Circus, Sloane Square and Paliament Square in the near future.